Our Jet Fuel Drum Coffee Mug is sure to put a smile on a gift recipient’s face. This fun, novelty, coffee mug is actually shaped after an aviation jet fuel drum. And, to add to the aviation look the handle is in the shape of a gas pump. 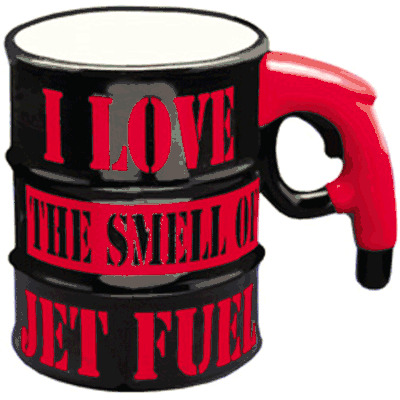 So if you, or a friend, love the smell of jet fuel, this mug is for you! I absolutely love the mug. Thank you for creating such a cute item! I received the mug in about 3 days. I was very pleased with the finish and size. It may bring back memories of working on aircraft, like it did for me. Like it says, I like the smell of jet fuel, in the morning. Enjoy. ProsGood finish and size. Excellent shipping time and packing. I bought this for the wife since she is a pilot. She loves it, even posted a picture of her drinking coffee on facebook with it.